Straight from the Word is exactly what the title suggests. This devotional uses three or four translations to expound on a scripture, which amounts to a mini-commentary on each page. 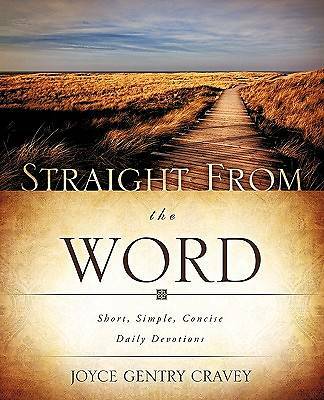 This aids in comprehension of the scripture while the repetition helps with remembering what you have read. They are simple devotions; quick and easy to read, and will hopefully give you something to think about each day. Most importantly, they will put the Word into your heart and mind. Joyce Gentry Cravey was born and raised in Dalton, Georgia, but has lived in Central Florida since 1969. She graduated from Dalton High School and attended Berry Schools and College in Rome, Georgia. She and her husband Jack are members of First Baptist Church of Mt. Dora, Florida. Joyce and Jack have a "his, mine and ours" family of six children and their spouses, fourteen grandchildren, and two great grandchildren. Needless to say, their get-togethers are large, noisy, and lots of fun. This devotional is the result of a need for a personal devotional that would concentrate upon getting the Word into hearts on a daily basis. This is her first attempt at putting together a book of any kind, and it is her prayer that it will touch hearts and lives.